To celebrate the 30th anniversary of Tokyo Disney Resort, Tokyo DisneySea has announced plans for a new show that will debut at the park next year. “Mickey & Duffy’s Spring Voyage” will run from March 18 to June 30, 2013 and will tell the story of Duffy and Mickey as they travel around the resort to celebrate springtime. The gang will hop aboard a boat from Cape Cod and visit several stops along the way, including Mediterranean Harbor, American Waterfront and the Arabian Coast. 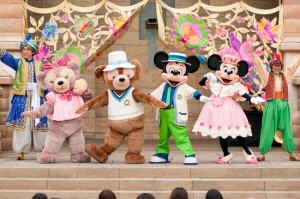 At each resort stop, Duffy, Mickey and other springtime characters will perform mini-shows for guests. Are you excited to experience this new Tokyo DisneySea experience for yourself?